It tell us right now we acting as an Access Port that’s our Operational Mode, we are not Trunking currently our mode is set to Dynamic Auto, we willing to form a Trunk if we receive a DTP frame, but it looks like we haven’t received a DTP frame because we are operating in Access mode, and we can also see that Encapsulation Type, if Trunk were to come up is gonna be negotiated that’s probably not what we want, we probably want to hard cod Dot1Q as the Encapsulation Type, also if we formed a Trunk the Native vlan would be Vlan 1 and let’s see how to set that to a non-default Vlan, keeping in mind that both ends of a Trunk need to agree on the Native Vlan. Let’s hard cod the Trunking Encapsulation to be Dot1Q on both of these ports, let’s also set the Native Vlan to be 100 something other than the default we need to make that match on far end Switches. And let’s set up fastethernet 1/0/13 on Switch Sw1 with a mode of Dynamic Desirable that will cause to send DTP frames down to Switch Sw2 which is configured for Dynamic Auto that gonna cause the formation of Trunk and just illustrate that settings, the Trunking mode to Trunk also sends those DTP frames we set the mode to Trunk on fastetherent 1/0/14 and we see that Trunk is formed there is well. Instead of Dynamic Desirable, Trunk mode gonna also send DTP frames that also gonna bring up Trunk because the other end is set to Dynamic Auto. Now the Trunks should be happy, let’s go back to Switch Sw1 and let’s give that command to show up what Trunks we have currently on the Switch. Notice that our Native Vlan is 100 for each of these Ports, notice that we hard coded Encapsulation to be 802.1Q and we are currently Trunking for both of these ports. 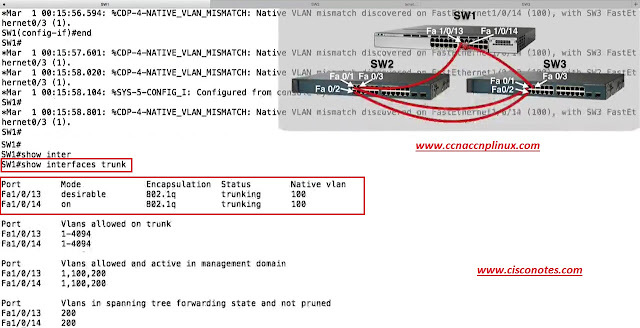 We have now created Vlans on our Switch we created Trunks, set the Trunking encapsulation type to 802.1Q, we set the Native Vlan to a non-default value but something else we might want to do Trunks is to limit what Vlan’s are gonna be allowed flow over those Trunks, this can help us from a Security Prospective because by default all Vlan’s are allowed over a Trunk this means that Unknown unicast, Broadcast and Multicast traffic for all the Vlans flow over a Trunk by default, this might open up the opportunity for the Malicious user to capture packets. 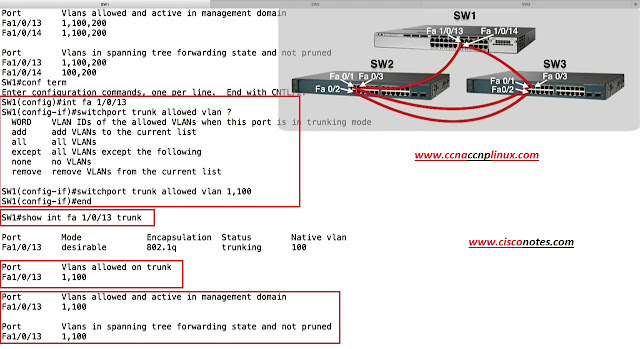 They should not be seeing and also eliminating the Vlan’s allowed over trunks can help us from Quality of Service prospective because we don’t have an unnecessary packet flowing across the Trunk containing from the Trunks Bandwidth, rather alongside traffic that does need to flow across the trunk and here on Sw1 let’s take a look at, what Vlan’s are allowed over the Trunks we created. 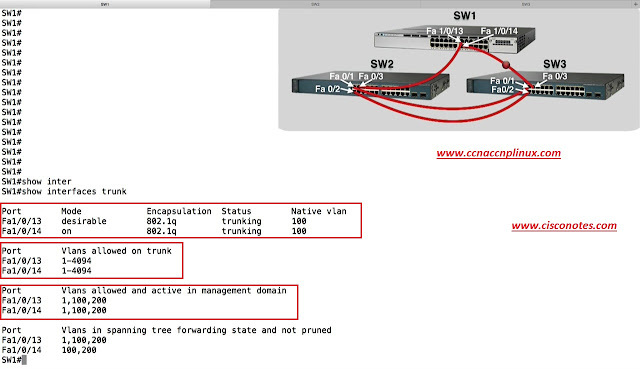 ü Word: - is specify the individual Vlans, that are going to be allowed over this trunk Port and we just separate the Vlan with a (,) Comma, we could say 1,100,200 and that would be allowed those 3 Vlans across this Trunk Port. ü All: - we could say “allow all of Vlans”. ü Except: - we could say, “allowed Vlan except” the following Vlans. ü Remove: - if we got our current list, we can surgically remove individual Vlans from Existing or Current Vlan list, if we wanted to. Now let’s go back and take a look at what Vlans are allowed on that Port. Currently though, it’s only 1 and 100 allowed and we can see Vlan 200 is no longer allowed over this Trunk port it’s only Vlans 1 and 100, that’s one way of setting this up. And we can see, we looking at the allowed Vlan’s on this trunk, it’s 1-199 and 201-4094, the only Vlan that’s not allowed is Vlan 200, and the only Vlans that are currently allowed an Active are 1 and 100 because we said allow everything except 200 and that only leaves us with these 2 Vlans. That’s the look at couple of ways, we can go into a Trunk and Prun of unnecessary Vlan traffic, which we said could help us with Security as well as Quality of Service.